The first thing I tell my critical thinking students is that they should watch out for gorillas; that gorillas can be seen in the most unlikely places, and that they abound, even in lecture theatres. I am referring here to a very special kind of gorilla – the one that represents the assumptions we don’t see, the information we don’t hear and the ideas we don’t think about. The inspiration for this special sort of gorilla comes courtesy of the Visual Cognition Lab’s selective attention tests. In this now-iconic video (http://viscog.beckman.illinois.edu/grafs/demos/15.html), viewers are asked to count the number of times a ball is passed between a group of students wearing white T-shirts. So, undertaking the task, we watch the ball being thrown, careful to count accurately and careful not to be distracted by the students who wear black and throw a second ball. What commonly occurs is that we focus on the task at hand and entirely miss the gorilla. A full-size gorilla (well, someone in costume) passes right through the centre of the group but we, so focused on counting the balls, miss it completely. There is no trickery here – it is a wonderful example of how we just don’t see everything – even big gorillas beating their chests in front of our eyes! While this relates to our visual cognition, the analogy holds more generally to our thinking processes. We focus on a task, and our myopia fails to see the wider, broader view – our assumptions, other perspectives and non-included information. To be critical thinkers, we must be aware of our selective attention and be able to focus on both details and the wider view upon which ideas are based. We must use information, reasoning and evidence carefully and be conscious of our cognitive bias and hidden assumptions. Critical thinking is about using information in a thoughtful and logical manner. It necessitates looking at ideas in a non-superficial way to maximise the possibility of coming to a well-considered and good decision. It requires the ability to see logical connections, to reason, to analyse information, to consider different viewpoints, to evaluate claims and evidence and to formulate a judgement. One aspect of critical thinking that often goes unstated but is a most important element for cognitive development is the ability to apply skills in a flexible and relevant manner to a situation that is entirely new. This does not mean merely being open-minded and willing to change our views given good reasoning and evidence; it is about being able to take what, and how, we have learned elsewhere and apply it in a new situation. Knowing content is one thing but being able to understand the method by which a conclusion has been reached is another. Critical thinking is about being able to critique content, the “what” of what we learn, but more fundamentally, involves under­standing the methodology or “how” we think. With a solid understanding and practice of critical thinking skills, we can be confident in facing problems, even where there are no precedents to guide us and where clear answers may not be obvious. This is contrary to the “answeritis” condition that afflicts many students’ minds, where education becomes learning pre-given answers by rote. Critical thinking is about being able to take a new set of conditions, possibilities or problems and be able to apply our skills to respond in a reasonable, logical and non-superficial manner. Various methods allow for critical thinking, including dialogue, questioning and practising habits for a thoughtful mind. One method, argument mapping, has been researched, particularly at the University of Melbourne, and has consistently achieved a demonstrable increase in students’ critical thinking skills, as evidenced by the results from the international California Critical Thinking Skills Test. 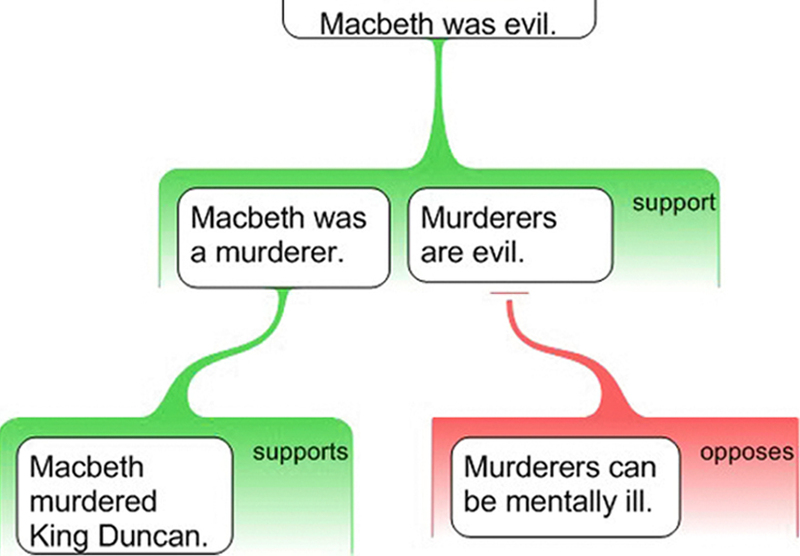 (For more details see Charles Twardy’s article “Argument Maps Improve Critical Thinking” published in Teaching Philosophy, 2004). 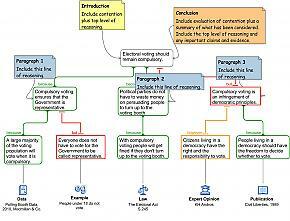 Argument mapping is a means of visualising thoughts and the thinking processes. It brings the world of information into a visual format, providing a logical structure for reasoning, evidence and evaluation. This allows clarity about the contention and claims and how they logically fit together to form an argument. 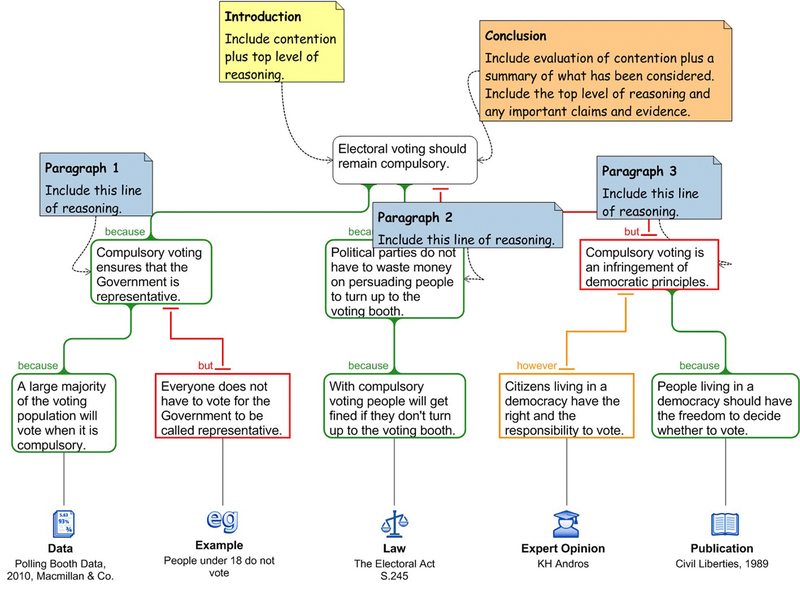 Figure 1 shows an argument map template. The map format is intuitive and utilises colour, shapes and icons – like a map – to guide us through an argument. It is akin to a mind map but with the specific purpose of providing a structured argument and a guide to the thought process. An argument map states the contention at the top. This is the central issue being considered and the main claim for which we wish to ascertain truth or falsity (acceptance or rejection). Underneath the contention is a box representing a reason. This is a single claim that has the purpose of providing support for the contention above. Another box represents an objection that directly refutes the contention. The reasoning underneath each of these boxes provides either a further reason to support the claim above or an objection that seeks to refute the claim above. This further level of support or objection has evidence icons attached, revealing the kind of evidence on which this line of reasoning is based, such as expert opinion, a statistic, an event or publication. The beauty of an argument map is that it provides a visual format to represent our ideas in a coherent visual structure. Importantly, while it provides a structure to reveal the claims being made, it also identifies their logical relationship to one another. 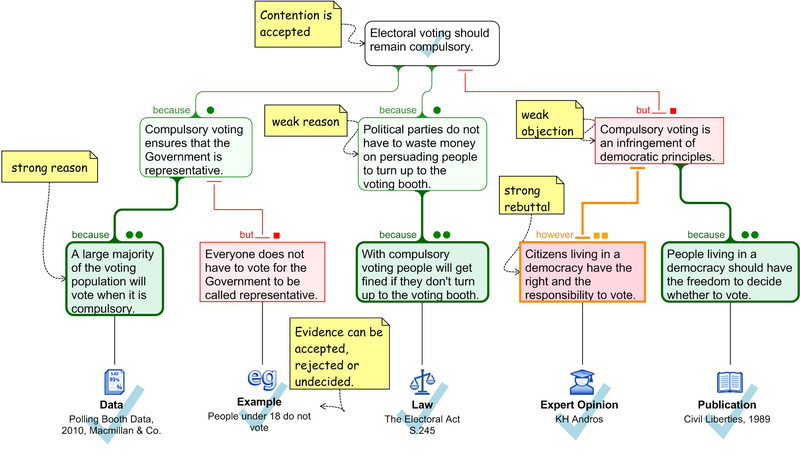 An argument map prompts one to justify views with appropriate evidence, at least for the bottom layer of each line of reasoning, and to have a fair represen­tation of support and objection boxes to ensure that both sides of an argument are being considered. When the structure of the argument is complete, then we can evaluate the argument. The evidence and claims can be judged as having weak, strong or nil value and, when using Rationale software, the colour of the box is accordingly changed to a strong or weak hue or a mere outline for those reasons or objections considered of no value. 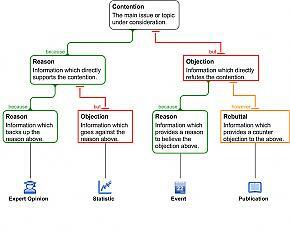 At the top level of reasoning, one then balances the strength of the reason(s) and objection(s) to formulate a conclusion about the given contention (Fig. 2). Conceptually, an argument map is like a house. The contention is the roof, the main reasoning at the top level the trusses, secondary-level reasoning the walls and the evidence the foundations. Unlike a flow chart showing consequences or a series of explanations, it leads us to accept or reject the main issue under consideration. Each level of evidence and reasoning provides support, while the objections make structural defects so that the structure fails and we are forced to reject the contention. 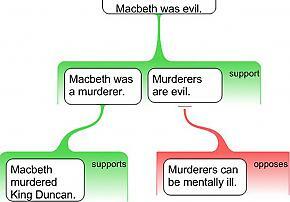 Argument mapping provides the structure and content for an argument. This provides the basis for an essay or presentation, where each line of reasoning represents the theme for each paragraph. It is a visual guide to the stages of critical thinking. Tip: Treat the information like jigsaw puzzle pieces: locate the claims being made and then sort them into categories or themes. The structuring stage is about identifying how the claims are logically placed. This involves sorting information into central themes and then figuring out which claim supports, or refutes, which. 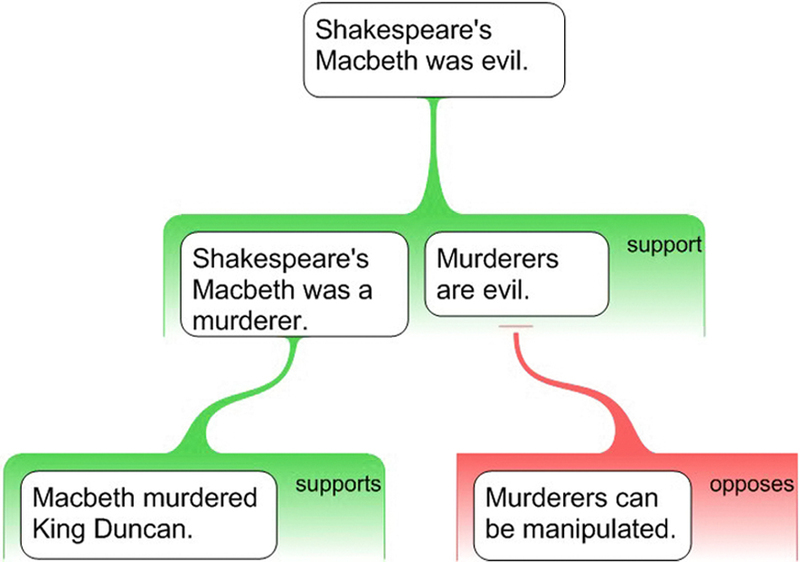 A map’s structure may be intended to represent other people’s arguments, so we do our best to structure it in such a manner that represents the reasoning provided (even if we think this is poor). Alternatively, the map’s structure may represent our argument – what we want people to believe. Whatever the purpose, the goal is to have an array of reasons and objections with supporting reasons, objections or rebuttals that each support (or refute) another claim being asserted. Tip: Ensure that each claim supports the claim above it (remember the house metaphor). You want to provide someone with a reason to believe that the claim above it is, in fact, true. To check it makes sense, read a claim and the one beneath it with the appropriate connecting word: “because” for a reason or “but” for an objection (Figs 1, 2). This is the danger zone – the natural habitat for gorillas! Often we can disagree with one another, but it’s not actually clear what the disagreement is. Frequently, the assumptions we have made or our underlying beliefs have coloured our view. Even when we have disclosed the assumption, we may not agree with other people, but at least we can be clear what the disagreement is and thus have a better chance to accept our differences or come to a resolution. The way we can locate assumptions is by taking a mathematical approach to the connection between one claim and the claim that supports or rejects it. This takes some practice, but it locates key assumptions that may indeed be the flaw in an argument (Figs 3,4). Tip: Structure the argument with co-premises. This means “unpack” the reason to identify its main premise and its co-premise. The latter is not a separate reason but acts to connect the key ideas from the main premise to the claim above it. Frequently, this co-premise is the assumption. To ascertain the co-premise, firstly underline all the key terms or phrases in the main premise and the claim above it. The co-premise(s) will ensure that each word or phrase between these three claims is repeated at least once. Refer to Figure 4 to see how the notation format links all the key terms in a triangular shape. The evidence is often the starting point for the claims being asserted, so when we identify an argument we should be seeking to identify the evidence upon which it is based. This may include an array of information sources, such as personal observation, data, statistics, expert opinion, publication, law and events. Tip: If you are formulating an argument, ensure you use reliable evidence from an array of sources. Note that many claims will often be best supported by certain types of evidence, such as statistics, data or expert opinion, though personal observation or a case study may be appropriate to justify. The evaluation stage requires that we form judgements; that we ascertain whether the evidence and the reasoning are, in fact, reasonable. In determining whether a claim is acceptable or not we need to answer two questions: is the claim true and, if so, does it appropriately support the claim above it? This requires a recursive evaluation process, where we evaluate from the bottom level to the top level. If the structure is logically correct or valid, this will make evaluation easier as it will become an issue of whether the claims are in fact true and hence constitute a sound argument (Fig. 2). Tip: Consider evaluation as though you were inspecting a house. If the foundation (evidence) is not solid, then it will mean that the trusses and walls (reasoning) will be weak and thus the roof (contention) unlikely to be upheld. At last we reach the top level of the map where we determine our conclusion, being whether we accept or reject the contention. At this stage we need to balance strong and weak reasons against strong and weak objections to determine which side of the scale is weightier. Of course, the judgement is only as good as the information, the evidence and the reasoning that is utilised in the map, and therein our conclusions will be provisional – based on the information available at the point in time – and thus can change with the addition of more reasoning and evidence (Fig. 2). Tip: Think of yourself as a judge or jury. You are being presented with a case for an issue and a case against it. You must consider both perspectives, the quality of their arguments and their evidence in order to come to a judgement. The argument map is not created simply as an attractive diagram. It provides a visual guide to understand an argument and provide clarity about the logical relationship between claims. Importantly, the map provides a structure for communication. Each line of reasoning represents a paragraph for an essay (or two if complex). For a presentation it provides a framework to assist memory and to provide a roadmap for the audience listening (see Fig. 5). Tip: The introduction and concluding paragraphs should contain the contention statement and the main reasons and objections under consideration. 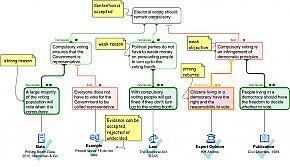 Argument maps provide an excellent means to turn an array of information and ideas into a coherent logical structure. They can be used to identify strong and weak reasoning and show where there are gaps in our evidence. Whether we are trying to understand the arguments of others or wanting to clarify our own thinking, argument mapping provides a means to see both content and a process. Having this skill allows us to adapt to new situations throughout our lives. We can respond to the unknown with some degree of confidence because we know how to respond and, of course, how to seek out lurking gorillas.